We are at the end of the road! Vanguard´s big finale is here!! This time it is truly especial, not because it´s the Season´s end or the end of the G series; but rather of this story that was presented to us 5 plus years ago with the first chapter of the original Cardfight!! Vanguard anime. Now, while the reboot is about to come in May 5, the story told will be quite different since this time around we will see an adaptation of the manga made by Akira Ito (Yu-Gi-Oh! R) and while they start more or less the same, the differences from the anime and the manga are quite clear early one... So yeah, this is the end of this “Cardfight!! Vanguard” Reality. So let us not lose more time and start seeing the epic finale of this tale!!! A transition chapter; in Cray the Zodiac Time beast alongside other units like Altmile and Ahsha have gathered for a last fight against Gyze, they have been blessed with the Messiah and on his name they will defeat him! Meanwhile A defeated and injured Kazumi has been found and now he is in an hospital care; He wants to tell Chrono the last thing that kazuma told him. Meanwhile in the rest of the world, everything is going down, everything is disappearing since Gyze is the Dragon of nothingness, so his will is to disappear everything. Still if one challenges the… For a lack of a better world, mud (that can take human form) the process of disappearing can be slowed; therefore all of the fighters start fighting those things! Back with Chrono, he receives Kazuma´s message and it is that he still can be saved; but now Chrono and the rest of Try3 has to do it… So after that Chrono and the others go where everyone else is…They have gathered to give a final… No just a good luck wish for Try3 on their fight against Gyze, a fight for the destiny of both Earth and Cray; everyone say the name of the Messiah and our Heroes goes to their last battle! The fight has started against Gyze; the will of the universe has spoken…In representation of the Messiah Try3 will fight; either the nothingness or the creation will survive after this! Gyze will fight against the 3 of them at the same time on different matches. The fight starts and Gyze is being a very difficult opponent, still nor Chrono, Shion or Tokoha will give up! On the side of Chrono he is being talked down by his younger self, since while Chrono was able to open up a future for himself… But the twisted voice inside himself tells him that Kazuma´s fate was sealed the moment he crossed paths with him… Still Chrono won´t back down; Shion meanwhile is resolved to protect this world, and Tokoha knows that even if they are weak, when people gather they can make a miracle! Meanwhile the fighters (including Shouma and other faces we haven´t seen in a while ) keep fighting the good fight…Oh! Also Baby Ryouzo is there!... not fighting though, just being adorable; Aichi and Ren with their Psyqualia are feeling all the will of the fighters and how their desires are gathering towards Try3 on this final fight! Now on the fight; Gyze has completed on all 3 matches the arrangements to enter the battle; the last turn of this battle is about to begin it´s do or die time! An Amazing chapter!! Everything was perfect on this final chapter, the tension of the fight and what comes on the final menace Try3 had to fight! Although I am heading myself again…So let me start from the beginning. The chapter started exactly where the past one left off; Gyze has come to the 3 battlefields and our heroes, Try3 will have to face him! Therefore Shion, Tokoha and Chrono made use of all of their abilities in order to not be defeated by Gyze! Now it´s their turn to fight back! Shion has decided to keep advancing, he won´t back down! He knows he is selfish and greedy, that he always aim for something that most likely he won´t obtain; but he can assure you that no matter the struggles he will do it in the end!! Tokoha will not back down against Gyze nor anyone! She knows her own weaknesses and sometimes powerlessness in doing what is right at the right moment; but not this time! Not when everyone she loves and is dear to her depends and supports her!! Chrono is ready to aim for his future now! The shadow of his past dispels when Chrono realized that everything he has done he grasped with his own hands and hasn´t let go anything that is dear to him… So now he will embrace that future awaiting for him, a future where everything he loves is with him! Our three Heroes makes their moves and they are able to defeat all the defenses that Gyze has brought with him, defeating the God of Nothingness once and for all; the will of the Universe has sided with the Messiah and the creation will continue it´s own existence!! Finally, Chrono is able to grab Kazuma´s hand…He has come back. Back on Earth the skies goes back to normal, the beings of nothingness have disappeared and everything looks like if nothing had passed; Kasumi grabs his (naked) brother, Kazuma now is safe… Soon enough Taiyou joins them. Still…This isn´t over, the immense energy held on Relics, augmented by what was of Gyze and the confrontation of the forces of destruction and creation have created a black hole of sorts whose energy will destroy both this World and Cray… Still, like following their own instinct Chrono, Shion and Tokoha goes towards it in their last Stride, the Dimentional Stride!! Chronodran warns Chrono that when this is over, the connection these 2 worlds will end, Chrono says that this is how it should be…He will be just another Fighter, not a singularity or anything. Their beings fuse with Altmile, Ahsha and Chronojet Dragon, now they will fight this last fight in order to save the world! The animation was amazing on this part BTW, one can see they used a lot of their budget on this epic part, plus accompanied by Mamoru Miyano´s Break it (AKA the song of the first opening of Cardfight!! Vangaurd G). Our Heroes goes destroying and avoiding obstacles until they reach the core and together destroy it!! The world is finally safe! Chronodran, Ahsha and Altmile gives their thanks to Try3 and they separate each other. Now…Try3 have a time to talk on this brave new world… Shion says that he has already planned everything, his plan hasn´t changed, he will make the Kiba Company one know in all the world AND he will carve his own name in business, fencing and Vanguard, he will be a legend in everything he does and loves! Tokoha has speaks about her plans in going pro, starting at the Euro League, known for being one of the most hard places where the most talented and capable fighters gather! Still she knows it´s a rocky head; but she thrives at the face of adversity, so sooner or lather all of the world will tremble with her name! Chrono for his part… He already knows his plans; he doesn´t need Stride Gates, Psyqualias or Singularities… He will carve his path towards a new connection with Cray, one he will make step by step and with his own two hands! A very enjoyable chapter that has brought us to the time when Cardfight!! Vanguard G was more a Slice of Life Anime with a Card Game gimmick rather than a more normal Card Game series; but lets go to the chase, this chapter was more like 3 different chapters that focus on the lives of Chrono and the others after the events of Gyze and how goes to normal, so let´s check them out! The first story is how the Vanguard quest are back! The players can play or do different chores not actually related to this card game and have fun! !...Or something; in any case Chono, Kumi and Kazuma are together and have decided to make a join team called… Vanguard lovers of whatever their High School is… SO yeah, Kumi will have fun with her 2 guys today!..No, not in that’ sense. Meanwhile Taiyou, Hiroki and Saori are friends and their team name is Victories or something like that, with Hiroki being the hot blooded, Saori the Shy person and Taiyou the middle man that will balance the salt and sugar! At the same time Tokoha and Rin are playing with various fighters and are being promoted as the 2 “soon to be pros”…And yeah, their rivalry is still going strong! At the same time Hayao, Shion and Iwakura (Shion´s Buttler) are hanging around and fooling around, until they decided to visit the “Fight with the Vangaurd Idols” tent…Who could be in there?! Rumy Labyrinth? Saya? Or.. Or maybe Ultra Rare?! Here they go and… The Idols are Ibuki and Kai!! Ok… I think they sort of fit, although… Yeah. In another point Satoru is babysitting Ryuzu who is learning how to speak and it seems he is some learning to play Vanguard; when Satoru wanted to grab Ryuzu and his cuteness, he cries until Kasumi comes and makes it everything better because it seems he is good with children. So yeah, everything is good and a day full of fun and laughter. The second story is a Vanguard BBQ held by Ibuki for the Vanguard corporative plus some invited people like Jaime, Aichi, Kai and the rest of Q4. We see Asaka being lovey dovey with Ren, while at the same time we see Kai and Aichi male hawtness (for the Fujoshis!) On that point the male fa-service was big on this one since we see a lot of the male characters being on ridiculous situations and outfits, so yeah… Female Vanguard fans it´s time for you to see the goods! The story besides is how Jaime, Kamui and Satoru try to make Ibuki relax himself (and maybe getting him drunk) and their various tactics and how Mamoru even enter in such shenanigans (plus a little bone for the fujoshis in that regard). In the end Kanzaki appears and demands everyone to go away since they are making a lot of noise, Ibuki then invites him to come to play and eat… Which the previous United Sanctuary Branch chief just yells that they need to go now!! In any case Kazuma is explaining things to him, about cosines and sines and stuff and Chrono can´t understand anything… Much to his dismay Taiyou is able to understand all of that! 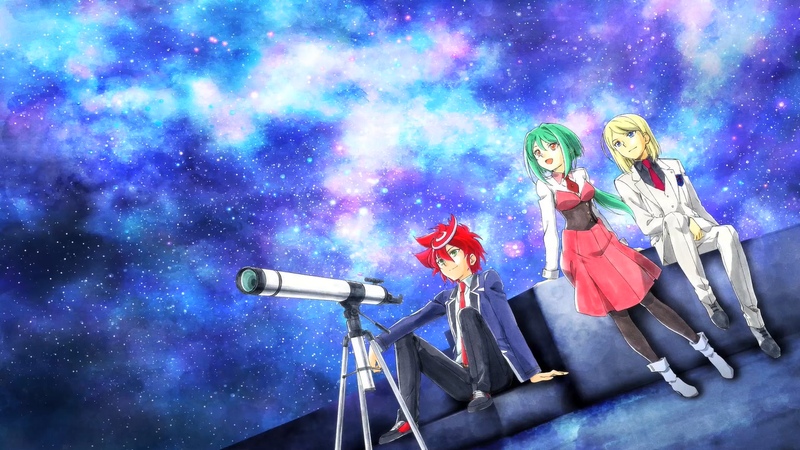 Kumi, Shion and the Trinity Dragon Trio joke that maybe Taiyou should be the one who aims to be an astronaut! In any case his next lesson has started and is an international one! Tokoha has joined the study session to teach him English! There is to say that Tokoha is living in France right now so they are using the wonders of the internet to be connected. Chrono is also failing hard on English too, although Kumi has brought an interesting point, which is that maybe a foreign language can´t enter in Chrono through his mind; but rather through his heart… So if he gets an international girlfriend then he would be forced to learn the language…Magically Jaime appears and tells his Amigo that if he wants to conquer any girl in the world: American, English, Arabic, Spanish, French, Russian, Chinese, ANY woman, just give him a shotout and he will make sure his Di… I mean his heart will fell in good hands and just like that he disappeared… That was weird because it isn´t supposed that Jaime is in the middle of a tournament right now? Whatever, it´s time for a break! In the break Shion puts Chrono through a test all the astronauts endure, which is to complete a puzzle that only has white pieces, Chrono starts until suddenly his mind just go broke and he fell unconscious due to over work! Suddenly somewhere in America, an adult Shion is talking how his company is doing a space shuttle and the launch is today! Although he did not do this alone since Tokoha (also an adult) gave some of her fortune won by winning international Vanguard tournaments to finance this project! Suddenly Chrono appears, he is an astronaut, and no, he wasn´t chosen because he is Shion friend; but rather because he earned that spot and he even can speak various languages! The launch is gonna start and everyone is very excited about it. The shuttle goes to the space! Suddenly Chrono wakes up, it seems he fell asleep and all of that was just a dream; everyone was worried about him and they say that maybe they should call it a day for now, Chrono says no! Since thanks to that dream he is already fired up! So he will keep working hard until he achieves his dream! And those where all the stories. In truth Cardfight!! Vanguard G has been a crazy ride since chapter 1, and I am glad I was able to see it all of it, it was an amazing experience and a series that I truly fell in love with, with the story, direction and characters, in the end I liked everything about it and yeah, it was for a long time a series I was looking forward to see every Saturday night (Sunday morning in Japan) and while it is a little sad that it won´t be the case anymore… I am happy to have seen this series! Plus on may 5 the new one will come, although in a night time (In japan) so let us see what the reboot has to offer! Still, for the time being let us shout once more…. Stand Up!! Anyway That is all So See ya in whatever other opportunity the fate might bring us!